Where can I get a nice set for Capablanca chess? Because I'm odd, I'm interested in obtaining a nice-looking set (that need not be portable) for Capablanca chess, the third world champion's chess variant which is played on 10 x 8 board and features two new pieces for each side: a chancellor that can move like a rook or a knight, and an archbishop that can move like a bishop or a knight. Is there a place that sells such sets? I'm recording this answer here because it took me quite a bit of searching to find something, primarily because I never found any sets going under the actual name "Capablanca chess." I did find workable sets under the names "Gothic chess" (apparently because of someone's fairly recent spin-off of Capablanca chess) and "Grand chess" (intended for a 10 x 10 board, see below). I've only managed to find one 10 x 8 board, this one from House of Staunton. In addition, they have a full set of pieces (including pieces designed to be archbishops and chancellors, with a 3.75" king height) designed to fit the board, so that's at least a working answer to the question. Unfortunately, that piece set runs $200, so an alternative would be nice. That set costs a more reasonable $40, but features a 3" king, and so that set would unfortunately be out of proportion on the only 10 x 8 board I've found (the one above). If you're happy to use a 10 x 10 board (and ignore part of it for Capablanca chess), then this is one way to go. which can be used to represent the chancellors and archbishops of Capablanca chess. The good thing is that the movements of the new pieces (Chancellor and Archbishop) are easy to interpret because the shape of these pieces are a fusion of Knight and Tower and Knight and Bishop. Nobody will confuse. Another set you could use is the Omega Chess set. This variation introduces two Wizards and two Champions, but you could use one each on just the 10x10 board, or a smaller 10x8 board. I would use the Wizard piece for the Archbishop and the Champion piece for the Chancellor. I think Omega Chess is still available commercially. 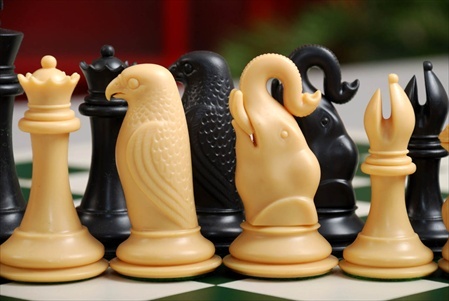 Gothic Chess sets are being sold in the United States in Florida and Pennsylvania. The 10x8 board and the full set of pieces. Much cheaper than the House of Staunton which is always overpriced. Not the answer you're looking for? Browse other questions tagged chess-variants capablanca-chess equipment or ask your own question. Where can I get a reliable and user-friendly, but not extravagant, chess clock? Recent research, or analysis sites, about some chess variants? 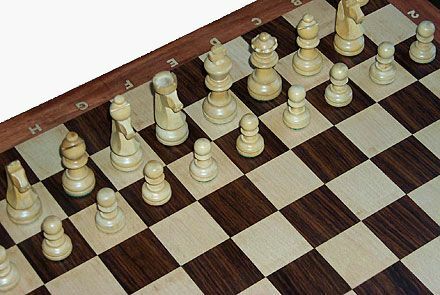 What are some good quality magnetic chess sets? What is this battleship-style chess variant called?